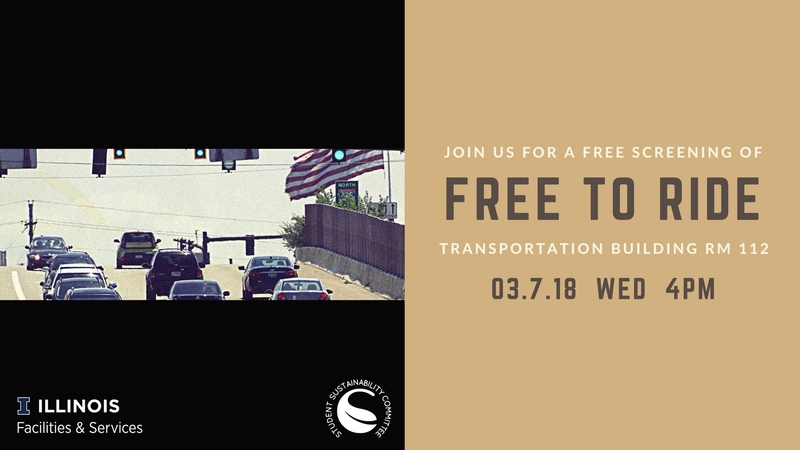 Free To Ride, a documentary produced by The Ohio State University's Kirwan Institute, highlights the relentless spirit of community leaders from across Dayton, Ohio who overcame a suburban contingent fearfully opposed to the expansion of public transit along a commercial corridor, and the system of checks and balances that allowed justice and reason to prevail. This event is free and open to the public. Join us on March 7th at 4pm in room 112 at the Transportation Building. Funding was approved for the Regional Planning Commission to proceed with a study of policies that could reduce transportation emissions on campus. See attached funding request for details. Summary: This meeting was our inaugural meeting for the year. On the agenda today was the creation of a team description, a review of ongoing projects, and planning for future meetings. We collectively crafted our team description for the iCAP portal, which can be found at: https://icap.sustainability.illinois.edu/project/transportation-swateam. Claire and Petehelped foster a discussion about the current types of alternative fuels for campus fleet vehicles. Currently, natural gas is the only type of fuel seriously looked at. One concern was that the gas CNG, while possible to implement, would be somewhat costly and have little payback unless driven many miles. Electric vehicles were brought up, but are currently not part of the market. Biodiesel was also mentioned, but its performance in cold weather is a concern. Lily discussed the ways that this project will reduce single occupancy vehicles. One idea looked at was bike sharing, which has been tried by Purdue but does not have much payback economically. Lily also discussed “It’s your MTD too”, which features social bus-riding trips which introduce MTD to campus employees. This was a summary of effort to make campus more bike-friendly. This would include having more, and better, bike parking. UIUC was recently recognized as a bronze-level Bike Friendly University by the League of American Bicyclists. We decided that every other Friday at 1pm is a good time to hold meetings. We will be holding meetings in the National Soybean Research Laboratory. Our clerk Josh will send out reminders. "The iWG endorses this recommendation with the stipulation that survey questions should be vetted by the Transportation SWATeam and/or the iWG before the survey is performed." See attached the iWG assessment complete with official comments from all the SWATeam members. See SWATeam recommendation Trans002 Parking Survey here. Following the completion of iWG assessment of Trans002 Parking Survey recommendation, it was forwarded to the Parking department on May 4, 2015. See iWG assessment of Trans002 Parking Survey here. The Transportation SWATeam submitted a recommendation stating, "We recommend that Parking Services organize a survey to gauge stakeholder interest in alternative parking plans. More specifically, a survey to gather data on how receptive stakeholders would be to parking plans which included a smaller amount of parking days per year to permit alternative commuting modes when this is feasible." See attached the SWATeam recommendation, Trans002 Parking Survey, complete with comments from all the Transportation SWATeam members. CUUATS completed a University District Traffic Circulation Study, using information from a campus-wide statistically relevant survey. The following table shows the mode share information based on the survey conducted in April-May, 2011.